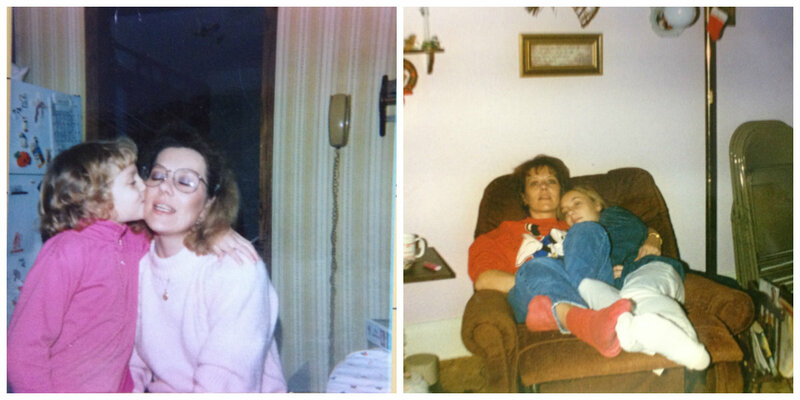 Growing up my mom and I had our spats like any typical mother/daughter relationship. I remember vividly one infamous memory where we were "disagreeing" and somehow my glasses paid the price. You see, I was running down the stairs to argue my point as my mom was rounding the corner to go up the stairs. But her hand was raised, as if to threaten me, and we smacked into each other, my glasses flying off my face. My mom likes to tell the story differently, like she does all stories, embellishing them, confusing tidbits of information and mixing them up with other stories. For example, there's another infamous story she likes to tell about the time she came home to find me chasing my siblings around with a knife. OK, so, yes, there was a knife, but I hardly doubt it was as dramatic as she likes to tell everyone. We have a lot of stories like this that get told and retold, arguing over the accuracy of the details. These stories, and the retelling of them, make me smile. They are evidence of a happy childhood, a happy family. It is important to remember this, because there was a dark period in my family's history that began the summer I moved away to college. My parents divorced. And like any divorce, this destroyed the dynamic of our family, which took years to rebuild, reshape, redefine, rediscover. But just recently as my sisters and I sat in my mom's living room late one night crying and laughing and discussing things we hadn't really ever discussed before, my mom professed something that could most possibly be the truest statement I've ever heard. She said through some tears: "I was a damn good mom." Indeed, she was, and still is today. My mom and I, circa the 90s. I don't think I could fully grasp my mom's role in my life until I became a mother myself. I remember texting her one awful, tearful morning as I held my toddler through his newest challenge: tantrums. Before the tantrums was colic. Five long, torturous months of needless crying. 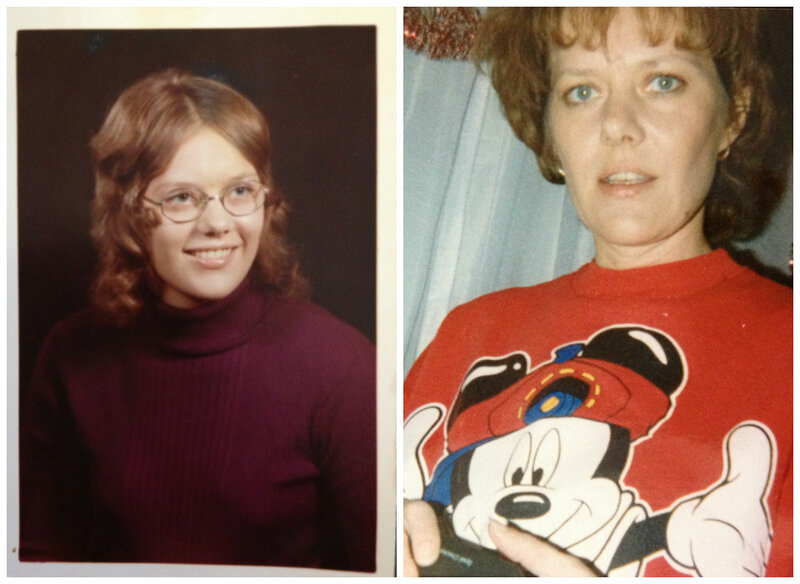 My appreciation for my own mother was never more apparent than in those moments. She likes to tell a story of herself as a young mother when my little sister was a baby. She would sit on our old beloved mustard-colored rocker loveseat, with my older sister on one side of her, me on the other and my little sister on her lap, patting us and rocking and crying, just trying to survive. Sometimes that's what motherhood is all about--blindly surviving. And love. Of course, love. Watching my mom as Grandma Keeha warms my heart. There is a certain C word my sister-in-law banned from her house, a word my brother liked to use freely. To get around not being able to use this C word, he devised a reversed-acronym of sorts to substitute for the actual word: C-U-Next-Tuesday. (I'll let you figure out the crude word and you'll understand why it was banned from his house.) We discovered this tidbit of information one day as we were piled into my brother's work truck on a trip to the hospital when he called out what we thought was, "See you next Tuesday!" When, really, he was just creatively cussing. But the irony of that banned C word was not lost on me as we were all traveling with my mom to a hospital under the threat of a completely different C word, a word we'd all love to ban from our vocabulary. Cancer. If ever there was a cuss word worthy of being banned, it'd definitely be cancer. You hear about someone's relative, someone's friend, someone's someone being diagnosed with cancer, and your heart skips a beat and you immediately extend your sympathies and promises of prayers, but you can never be prepared for how it'll affect you when that someone is your own mother. Upon confiding this news to an old friend as we made laps around the rollerskating rink--a fellow daughter of a mom with cancer--she effectively conveyed the sentiment I was feeling with one sentence: "It rocks your world." And it does. No matter how old you are and how removed you think you are from needing your mommy, learning she has cancer rocks your world. And you cry. And cry. And think the worst possible things. And then you cry some more. 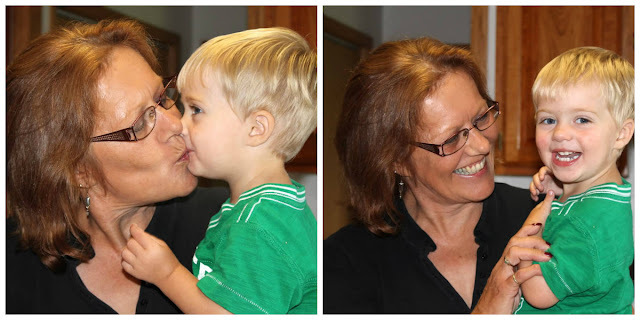 The day we learned about the banned C word in my brother's household, all four of us kids squished into a small room at a clinic as we anxiously waited to hear our mom's fate. We wouldn't learn with 100 percent certainty that day, but a few biopsies (and scary google searches by my sister) later, it was confirmed. My mom has cancer. Squamous cell lung cancer, to be exact. We were all breathing easier and relaxing into our chairs when the doctor announced it wasn't small cell cancer, a small victory in the cancer world, I suppose, but a victory, nonetheless. 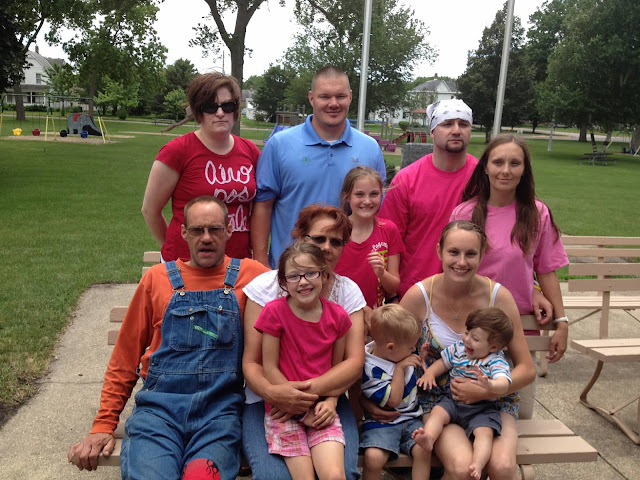 We all rallied together and sat in the waiting room while my mom got the lower lobe of her right lung removed. The surgery went well, removing all traces of cancer. After a short stay in the hospital and some follow-up appointments, my mom is healing great and is cancer-free. Now we wait another six months for her next appointment. I think we will all hold our breath at each appointment, because cancer is sneaky. But for now? 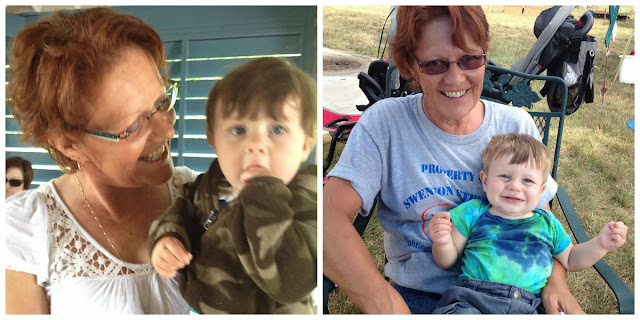 For now we're grateful for a healthy mom, grandma, daughter, sister, aunt, and friend. Squeeze your loved ones and hold them tight. You just never know what tomorrow brings. But today is full of love and life and the celebration of both. My family collaborated to make my mom a special gift for her surgery. 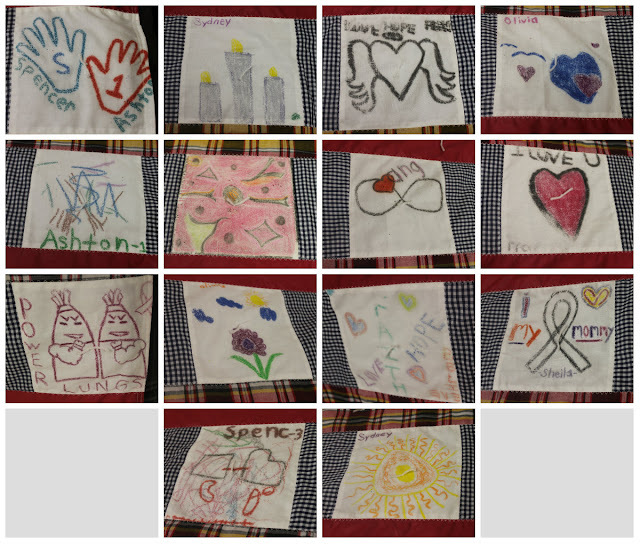 A bunch of sandpaper, crayons and some fabric, and here is our creation: a quilt of all our drawings. There are a few blank white squares to add more drawings over the years.